We’re not really ready to receive visitors yet—still fluffing cushions and straightening up—but sometimes synchronous events impose themselves and demand a hearing. 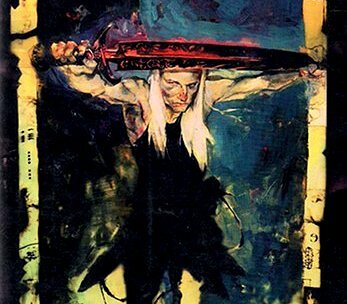 Karin Kross of TOR.COM has started a marvelous reread project of all of the Elric books by Michael Moorcock. Ms. Kross also notes in her intro to the reread project that Gollancz has launched a massive reprinting of Moorcock’s work. It’s a great time to be a fan of both Elric and Michael Moorcock’s many other breathtaking works. Albino Books is a general book-topic, book-selling and cultural opinion blog, but if we had a patron saint it would be Moorcock, whose willful blending of fantasy, science fiction, hardboiled, weird tales and the literary delineates an approach to genre that we share as both fans and booksellers: anything goes. Tagged Elric, Michael Moorcock, reprints, rereading, Tor. Bookmark the permalink.